The most important choices are the hardest. It’s 1918, and the Bolsheviks hold post-revolution Russia firmly in their grasp. Veteran Assassin Nikolaï Orelov embarks on one final assignment for the Brotherhood to secure his family’s safety – but his last mission will lead him to question everything. Join forces with the legendary Grand Duchess Anastasia Nikolaevna as you travel across a changing Russia rendered in an iconic, propaganda art style. Escape Ipatiev House in Ekaterinburg, fight in close quarters aboard the famous trans-Siberian express and infiltrate the Kremlin in Moscow on your quest to keep a Piece of Eden – and the Grand Duchess – out of the wrong hands. Play as both Nikolaï and Anastasia and adjust your tactics to suit the situation. Use Nikolaï’s mechanical winch and marksman skills to disrupt electrical components and take out enemies from afar; or utilise Anastasia’s distraction and infiltration techniques before dispatching opponents with her exclusive Helix Blade. 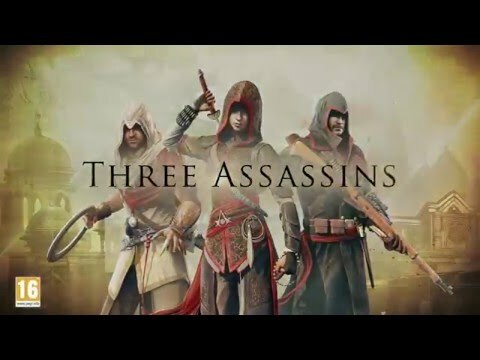 Discover betrayal and loss in British-occupied India and resurrect the Brotherhood in Ming Dynasty China in the Assassin's Creed Chronicles trilogy. Buy Assassin’s Creed Chronicles: Russia on PS4.